Let’s face it: With a rise in trends like the paleo diet, gluten-free regiments, and more people embracing vegetarian and vegan lifestyles, restaurant owners and chefs are seeking out new ways to incorporate fresh, healthy ingredients. One of the easiest ways to incorporate a variety of fruits, grains, nuts, and veggies is through the use of a commercial blender. Just think of all the soups, smoothies, and sauces you can whip up. 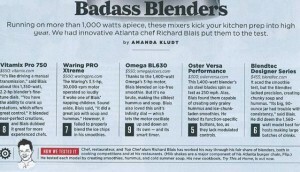 This past month, Atlanta restaurateur Richard Blais conducted rigorous testing on five commercial blenders for Men’s Health magazine. After enduring weeks of competition on Bravo’s “Top Chef” and winning “Top Chef: All Stars” Blais’ proven mastery of all things culinary certainly offered the right experience to know just what to look for in ideal commercial blenders. To verify the best blender to meet customers’ new demands Blais focused on the areas that typically cause the most problems for blenders: Ice processing, pureeing, and liquefying. The three-phase evaluation included blending a smoothie, liquefying a soup, and pureeing hummus. The Omega BL630 was the obvious winner. Named “Best in Class,” the BL630 was the only commercial blender to produce ice-free smoothies and silky, chunk-free hummus and soup. Its culinary excellence coupled with its variable speeds, infinity setting, pulse control, and 15-second to 6-minute time control made it clear which blender was worthy of a top chef’s kitchen. The Omega BL630 comes standard with a three horsepower motor, 64-ounce unbreakable tritan copolyester container, and a 10-year manufacturer’s warranty. This commercial blender is built strong to endure the demands of a food service kitchen. Ready to Blend Your Way to Culinary Success? 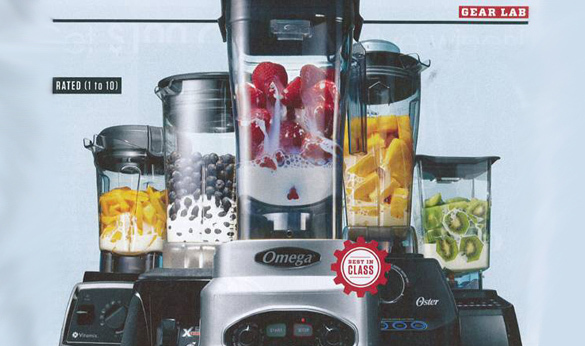 For more information about Omega commercial blenders or to browse KaTom’s wide variety of commercial blenders, visit www.KaTom.com. To speak with a helpful associate, call 1-800-541-8683 or email info@KaTom.com.